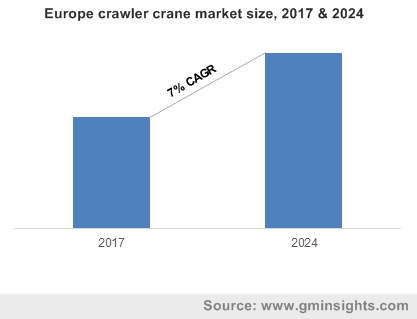 Crawler Crane Market size was valued at approximately USD 1.8 billion in 2017 and will grow at a CAGR of around 7% from 2018 to 2024. The global shipments are expected to reach around 4,000 units by 2024. 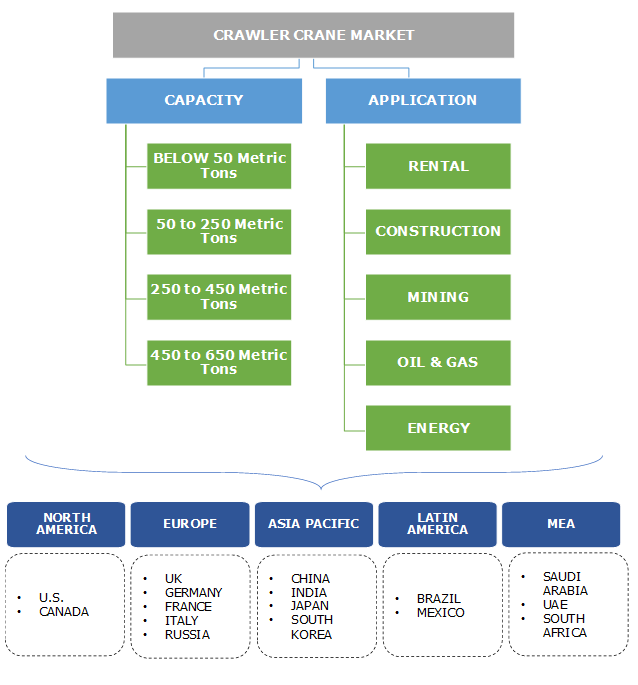 The crawler crane market is expected to grow at a rapid pace due to the increased investments in the infrastructure development and energy sectors by the developing economies. Several government initiatives for upgrading the existing infrastructures are expected to generate a high demand for advanced machines in the construction sector. The applications of these machines in underground mining help in ensuring the safety and security of the workers, thereby contributing to the crawler crane market growth. The major players in the crawler crane market are offering machines that are specifically designed for several applications such as for mining operations. These players are developing equipment designed with several safety features to reduce the chances of workplace accidents. Several government regulations and guidelines are developed for inspecting and testing the safety of this equipment. For instance, the Quality and Safety Standards Committee developed standard CP 37:2000, which provides several guidelines for the application, maintenance, and operation of the equipment for safe use. High costs associated with the purchase of new machinery will hinder the crawler crane market growth. Smaller companies working on construction projects prefer traditional human involved techniques over the modern and costly machines. Such companies do not deploy these machines due to the high maintenance and operating costs. These machines increase the company’s expenses due to additional fuel requirements and maneuverability issues. A major issue with the high-capacity crawler cranes is the bulky structure and weight that creates transportation and installation problems. The demand for 250 to 450 metric tons crawler crane in the U.S. is increasing due to enhanced safety features and technical advancements added to the new models, expected to grow at over 10% CAGR from 2018 to 2024. Major applications served by these machines include construction and maintenance works of the infrastructure such as buildings, highways, railways, and bridges. To cater to these application-specific demands, the machines require high lifting capacities and longer working radius. Therefore, manufacturers in the crawler crane market including Liebherr and Kobelco are developing high-capacity & lightweight machines and focusing on reducing the transportation weight and machine dimensions. Due to the growing number of accidents with these machines at various sites, manufacturers are enforced to work on product development strategies that involve safer machines. For instance, Liebherr developed its 300 metric tons capacity LR1300 that focused on the safety features and implemented the control assistance features that ensure perfect verticality of the load on ropes. These features eliminate the chances of collision and keep the operators safe from accidents, further supporting the crawler crane market growth. The demand for below 50 metric tons machines in the crawler crane market is growing in popularity due to the benefits such as lifting in a limited area, easy transportation, easy loading & unloading, convenience in positioning close to the loads, extended overall life of the crane, and versatility. Most of the players operating in the crawler crane market such as Maeda Seisakusho Co., Ltd., Furukawa UNIC Corporation, Jekko s.r.l., etc., offers a vast range of equipment with varied lifting capacities and lifting heights, considering the demand for specific applications from the construction, mining, energy, and oil & gas sectors. Several advantages of the mini cranes include operation in narrow work areas, high lifting capacity in association with its stabilization area, adjusting the weight uniformly on the slab, high maneuverability with increased stability, and low ground pressure offering a better outreach in case of obstacles. The construction application segment in Japan is set to grow at 5.8% CAGR from 2018 to 2024. Government initiatives in Japan to upgrade the existing infrastructures for the upcoming 2020 Summer Olympics have bolstered the demand for heavy construction machinery such as mobile cranes including crawler cranes. These machines are extensively used in several applications such as oil & gas, construction & mining, and transportation & logistics, among others. 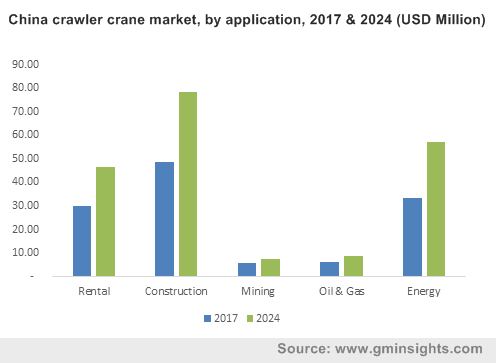 In addition, the increased investments for the construction of power plants and other energy infrastructure in Africa have positively impacted the crawler crane market growth. Energy sector applications of the crawler cranes include picking and handling of heavy wind turbine components, dumping waste, and the transportation of bulky products in energy conversion projects. The practice of renting equipment including crawler cranes as an alternative to purchasing has proven to be advantageous for several companies globally and has resulted in the robust growth of the crawler crane market. A major demand has been observed in sectors such as construction & mining, utility, and transportation, which have large-scale investments. Several construction companies across the globe prefer renting the equipment to reduce their project costs. A rental model is a profitable approach for companies as it lowers technical charges and maintenance costs. By renting the equipment, companies can evade the costs associated with depreciation and inflation while replacing the machinery. Europe is witnessing a high adoption of these machines in several industrial sectors. Rental services are experiencing a high adoption in the region owing to the presence of major players that are involved in providing such services. The technical advances in machinery development are supported by the strong manufacturing sector in Germany. Companies operating in the regional crawler crane market are focusing on expanding the global presence, boosting the industry growth. Furthermore, the French Government has initiated an investment plan to support the structural reforms worth USD 66 billion. North America will witness a steady growth owing to the rise in the need for renovation of legacy infrastructure and buildings. In addition, rising investments for the infrastructure development in Asia Pacific region will further surge the crawler crane market demand. The growing infrastructure activities in India and China have led to several equipment manufacturers expanding their presence in the country to increase their global footprint, thereby supporting the crawler crane market growth. Key players operating in the crawler crane market include The Liebherr Group, Furukawa UNIC Corporation, Hitachi-Sumitomo Heavy Industries Construction Crane Co., Ltd., Terex Corporation, ACE, Zoomlion Heavy Industry Science & Technology Co., Ltd., Palfinger AG, Manitowoc, Jekko s.r.l., Sany Group, Tadano Ltd., XCMG Group, Komatsu Ltd., The Escorts Group, and Hyundai Construction Equipment. The manufacturers are driven by the trend of offering cost-effective and efficient products owing to their usage in construction and energy applications. The companies in the crawler crane market distinguish their product portfolio by offering advanced functions and technical upgrades that aid in strengthening their competitiveness. For instance, Jekko s.r.l. develops innovative machines with features such as variable stabilization and radio remote controls. Companies in the crawler crane market are providing lifecycle support for equipment to help in maximizing the performance and gaining a return on investment. Players operating in the crawler crane market focus on covering the customers that require low-capacity machines in applications such as stonework, oil & gas industry, power stations, aviation industry, forestry, etc. Companies develop partnerships with the dealers and local rental companies to offer their machines to regional customers. Several companies in the low-capacity crawler crane market such as Maeda Mini Cranes and Furukawa UNIC Corporation have entered the renting business owing to the high demand for such machines. 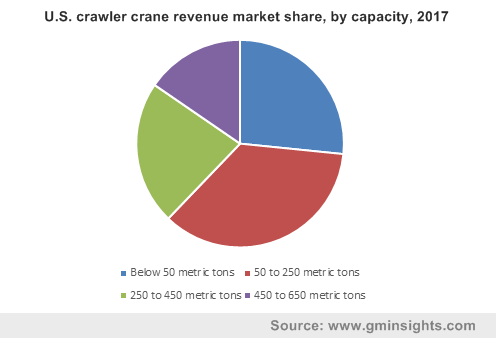 The global crawler crane market is primarily driven by the rising demand for lifting mechanisms, which are required in several sectors such as utility, construction & mining, oil & gas, manufacturing, and transportation & logistics. Companies in the crawler crane market focus on innovations and the development of compact, lightweight, and low-capacity machines. The majority of the manufacturers are highly into R&D activities to perform product innovations, enhance production capacity, and lower the overall production cost. Due to the communication problems in conventional crawler cranes, manufacturers in the crawler crane market have started deploying advanced telematics technology in the recent models. These programs aid customers in generating the product history files of machinery work hours, the latest maintenance & upgrade schedules, and fuel-consuming capacity. All these factors are essential during the renting and reselling of machines as they help buyers in taking appropriate purchase decisions. The technology provides drivers with easy driving operations under optimal conditions and enables the equipment maintenance functions.